230 pages | 6 Color Illus. | 19 B/W Illus. Professor Charles Wambebe obtained his PhD in Neuropharmacology from Ahmadu Bello University in 1979. He served briefly at Georgetown University Medical Center as Visiting Professor of Pharmacology and worked with the World Health Organization. He was consultant in Traditional Medicine to UNDP, UNIDO, African Union, Economic Community for Africa and African Development Bank. Professor Wambebe was the Pioneer Pro-Chancellor and Chairman of Council, Bingham University. His initial research focus was on the physiological roles of dopamine in the brain. He also published research articles on the neuropharmacological effects of plant extracts. 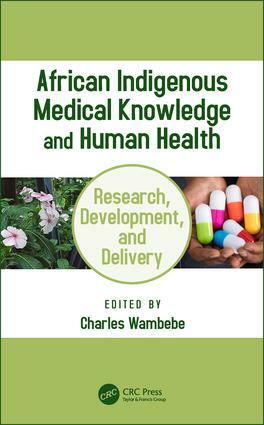 Upon his appointment as Pioneer Director-General/CEO of the National Institute for Pharmaceutical Research and Development (NIPRD), Abuja, Nigeria, he switched his research interest to development of phytomedicines based on African Indigenous Medical Knowledge (AIMK). During his tenure at NIPRD, he initiated and directed the research and development of Niprisan; a standardized phytomedicine for the prophylactic management of sickle cell disorder. It was a ground breaking research that earned Professor Wambebe The World Academy of Science Award in Medical Sciences (TWAS). Niprisan is generally regarded as clinically safe and effective. In recognition of his academic achievements, Professor Wambebe was elected Fellow of TWAS, African Academy of Sciences , Nigerian Academy of Science, etc. Professor Wambebe has published over 150 peer reviewed articles in international journals and contributed chapters to books. His current research interests involve development of phytomedicines from AIMK using African Food Plants. Professor Wambebe is currently serving as Professor Extra-Ordinary (Pharmacology) at Tswane University of Technology, Pretoria and Witwatersrand University, Johannesburg, South Africa.